A federal judge ruled for the second time Monday that Texas’ stringent voter-ID laws were crafted with the intention of discriminating against minorities, a ruling that follows on the heels of another court finding evidence of racial gerrymandering in how Republican lawmakers drew the state’s election maps. As the Associated Press notes, U.S. District Judge Nelva Gonzales Ramos’ ruling comes more than two years after she compared the ballot-box rules (known as S.B. 14) in Texas to a “poll tax” meant to inhibit minority voters. On Monday, Gonzales Ramos remained firm in her original stance made after an appeals court requested that she go back and take another look at her original findings. 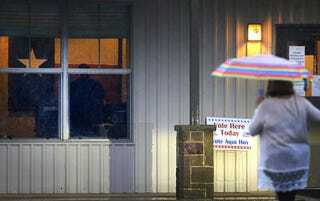 “Proponents touted SB 14 as a remedy for voter fraud, consistent with efforts of other states. As previously demonstrated, the evidence shows a tenuous relationship between those rationales and the actual terms of the bill,” Gonzales Ramos wrote. The rules require voters to show one of seven “approved” forms of identification while going to vote—for example, concealed-handgun licenses, but not college student IDs. In the November elections, a court ordered Texas to give more flexibility to voters under the law. According to the newswire, state officials have not immediately reacted to Gonzales Ramos’ ruling, although Texas could once again appeal it. Last month a separate three-judge panel in San Antonio pointed out issues in Texas’ voting-rights law, finding that Republicans racially gerrymandered some congressional districts to weaken the electoral impact of minorities.